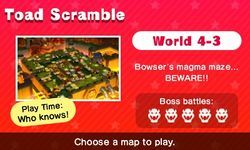 World 4 is the fifth set of boards in the Toad Scramble mode of Mario Party: Star Rush. They are unlocked by completing a game on World 3. 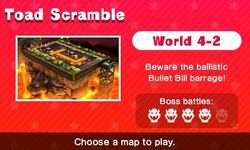 World 4 features a castle theme. Two boards feature rising lava. 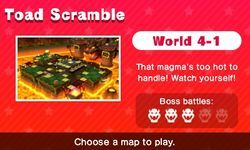 Every few turns, lava fills the lower half or multiple stages of the map, blocking off pathways and returning players who are caught to the start. One includes Bullet Bill launchers blocking thin alleyways, and every turn a roulette is spun to determine which of the two are fired. Characters are chased to the edges of the map, but can hide from the path of the Bullet Bill by hiding between pillars. This page was last edited on October 11, 2017, at 11:09.